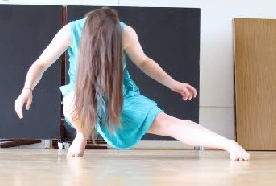 In 2012, with funding from Arts NSW, youMove Company provided an innovative platform for affiliated artists to work with Australian choreographers. Palimpsest was created by improvisation artist, Tony Osborne with collaborating artist Imogen Cranna for the project tenofus. Layers of written verse, overlaid through time, form the complex manuscript called palimpsest. Memories erased through constant reinterpretation become reality and three generations of women pressed tightly together express something real against the rubble of Alzheimer riddled dementia. Palimpsest is an exploration of times past by movement that occurs spontaneously in the present. An homage to Shirley…a shifting dance through which we search for meaning.